2008: Coming back to Hawstead eight years on was an absolute pleasure. 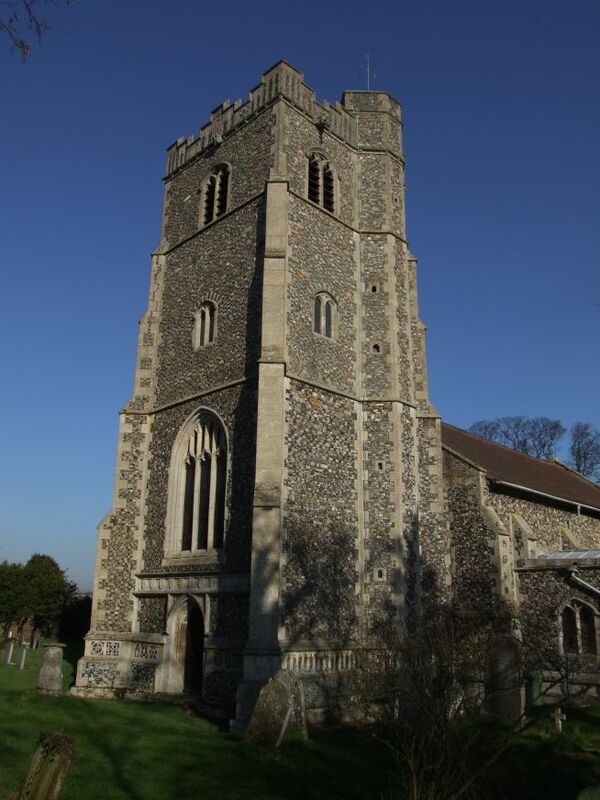 Few of Suffolk's churches cry out for a digital camera as much as All Saints does. There is so much to see in here that I took 150 photographs, which would have been impossible in the old analogue days. About half of them are here. Eight years ago, I came here on a blustery day in summer and found it locked. I came back on a cold, bright day in early February, taking my daughter for a bike ride around the secretive valleys south of Bury St Edmunds. I'm pleased to report that the church is now open every day, even in winter. Stepping into this fascinating church was to step out of time for a moment, and to find ourselves in a document of one of the great landed families of East Anglia. I was struck by quite how much I had got wrong on my first visit, and I have carefully excised as many errors as possible from the account below. I also had not remembered the wonderful Henry Holiday glass. How on earth had I not been moved by it before? It just goes to show that you should always go back. 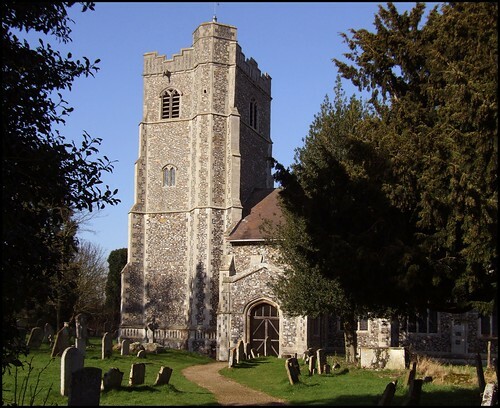 2000: Local historian Clive Paine has described this church as the Westminster Abbey of Suffolk. By which, I don't suppose he means that it hosts royal weddings, and fleeces Japanese tourists. No, he's referring to the monuments, of course. All Saints has more of them than any other church in Suffolk. Most of them are fairly simple, the sort of thing you'd find in many another Suffolk church. But some are among the grandest, and definitely worth the journey. However, the monuments and memorials are not the only exciting things here, as we shall see. Hawstead is a prosperous, pleasant kind of place, typical of the area to the south of Bury St Edmunds. The fine set of almshouses on the Bury road were given by the Metcalfes, one of the three families we will find commemorated in the church. You approach All Saints by turning up the lane by the lovely old school house, now a private home. You pass the simply enormous old rectory (what kind of a message did that send to 18th and 19th century Anglicans?) and at a dogleg turn you brush the graveyard, verdant and wild flower-filled. Amongst all this, All Saints is a big church. Its tower is a late one, the full flowering of early 16th century Perpendicular. A pelican in her piety is picked out in the flushwork The stair turret rises above the battlements, in the manner of Cavendish or Monks Eleigh. The whole church was substantially rebuilt at the same time as the tower, and is most impressive, despite the lack of clerestory and aisles. The chancel windows to north and south have been mostly filled in, apart from one on each side, and the reason for this will become clear in a moment. And, at the base of the tower, above the west door, an array of shields is cut into the stonework. There are a lot of them, and they are mostly for the Drury family, the major landowners in the area, and another of the families inside. The Cullum surname is also writ large here, and shields to all three of the families mentioned can be found, among others, in the windows of the porch. If I was to describe to you every memorial in this church, we would be here an awfully long time, and you would long since have gone off to do something more productive instead. Suffice to say, there are about 40 of them, they are most impressive, and they increase in size and glamour as you move eastwards. 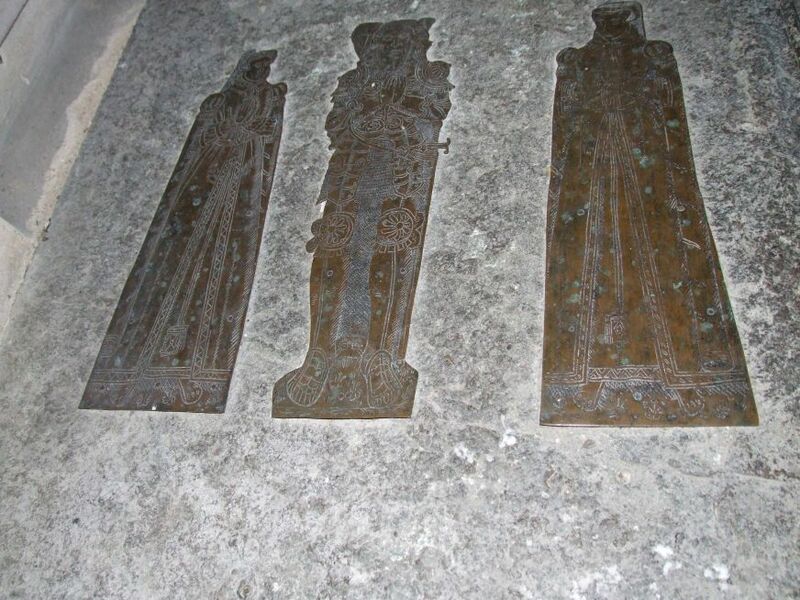 After nodding our heads briefly at the lovely 16th century brasses of Sir William Drury and his two wives (not at the same time, you understand) set in the tombchest behind the pulpit, which were stolen from the church in the 1860s and only returned in the 20th century, let us content ourselves with examining the memorials in the chancel. The oldest is a knight of 1271, in extraordinarily good condition. The sands of time have obviously fallen very softly here. He is set in the floor, an indication that it has been raised over the years, beneath a splendid recess arch. He is probably the splendidly named Eustace Fitz-Eustace. At the back of it is a curious disk with a moon on it. 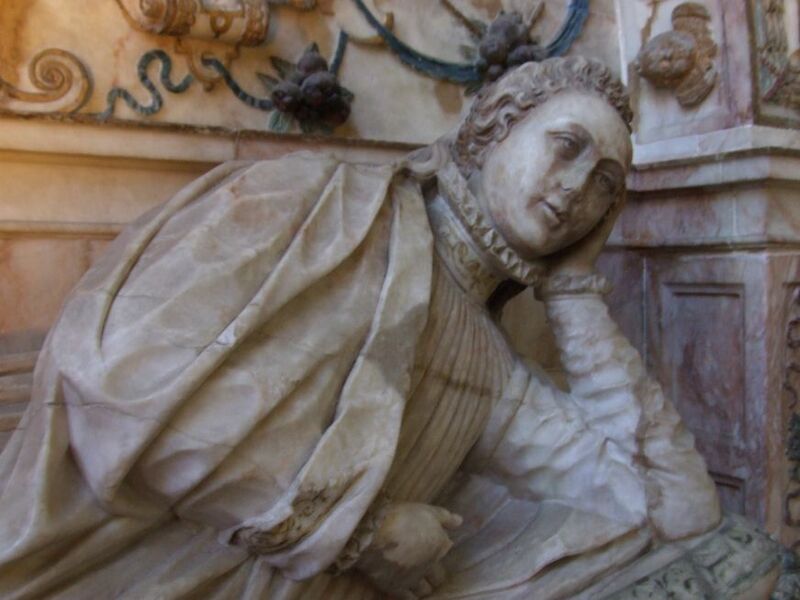 Mortlock thought it had probably been looted from an Islamic cemetery during one of the crusades.Moving clockwise onwards, we find Sir Robert Drury on the north side of the sanctuary, a favourite of Elizabeth I and friend of John Donne, who probably composed the epitaph. Opposite is his daughter Elizabeth,who died at the age of 14. Part of his plan involved marrying Henry, his oldest son, to a Catholic princess, either the Spanish Infanta or the French Princess Royal. To cement feelings at home, his younger son would marry Elizabeth Drury. Unfortunately, Henry died. The younger son was kicked upstairs into a marriage to the French Princess, and became the ill-fated Charles I, to be beheaded at Whitehall by the Puritan parliamentarians. The Catholics continued to suffer persecution, and the young Elizabeth lay in her cold grave. Such are the currents and fluctuations of history. 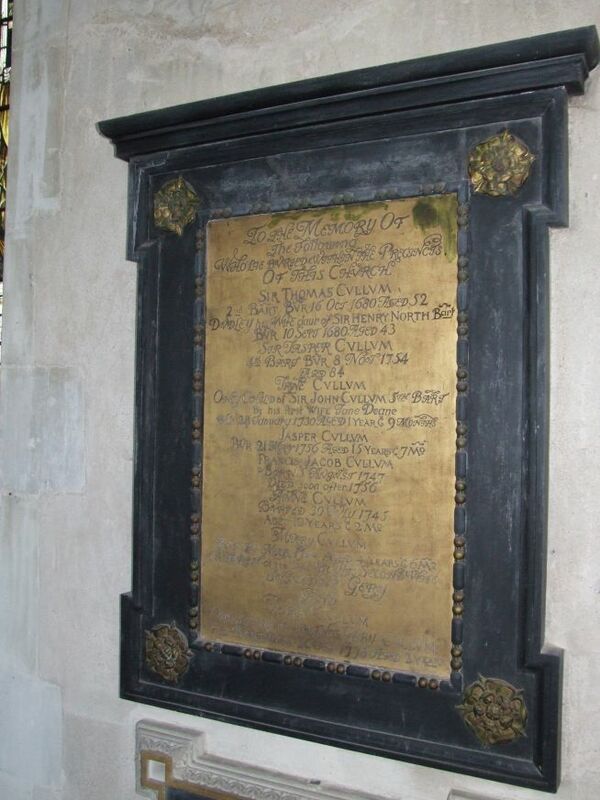 The epitaph here is also believed to be Donne, and can hardly be described as disinterested. To the west of this we have the grandest memorial in the church, Sir Thomas Cullum's of half a century later. The enthusiastically painted ceiling sets it off a treat. 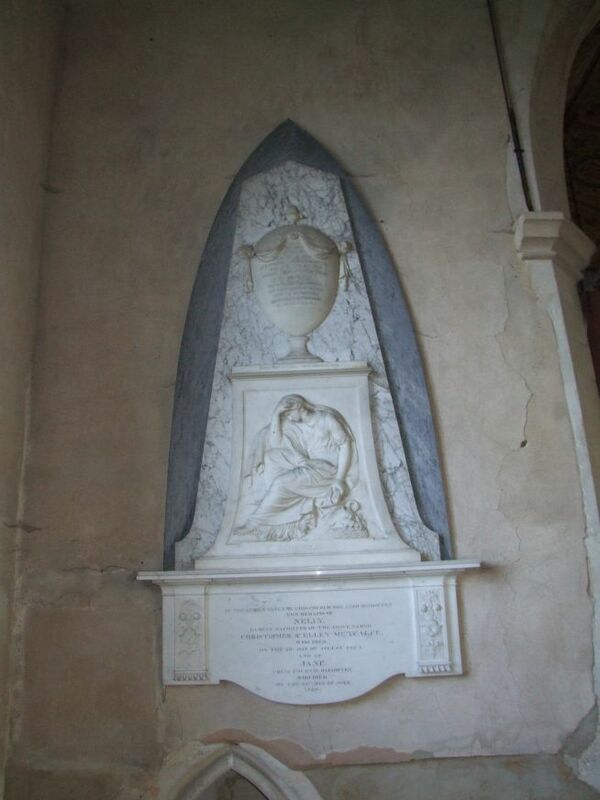 Mortlock reports that it was made in Courcy, and shipped in pieces to Hawstead Hall, and ended up here as a tomb. The colouring and fanciful heraldry are delightfully outrageous. The chancel is clearly kitted out for the highest of Anglo-catholic worship, and it is easy to imagine it filled with incense. The ceilured roof completes the effect, with its Marian monograms. Before moving on, check out the southern upright to the archway of the roodscreen. It has been sawn halfway through. The otherwise excellent guidebook blames this on that terrible William Dowsing, but I do not think that can be possible. Dowsing did not visit Hawstead, and in any case he never broke down a rood screen, anywhere in Suffolk. The attacks on rood screens happened first in some enthusiastically protestant areas in the early 1540s, more than a century before Dowsing. However, I think we can safely assume that Hawstead was not one of these. The next attacks came a little under ten years later, when the gloves came off under Edward VI, and then in the spring of 1559, when Elizabeth I dithered slightly before announcing that roodscreens should stay. Possibly a churchwarden went to work on it, and then was stopped by changing circumstances halfway through. More likely, it was a local hothead, who was prevented from carrying out the act of vandalism. We can never be sure, of course, but it is a fascinating relic of 16th century religious conflict. Coloured glass generally survived the great destruction of the 16th century Reformation, when the interiors of our parish churches were wrecked. The Anglican reformers were pragmatic enough to realise that any shattered sheets of glass would need to be replaced out of their own pockets. It wasn't until a century later, at the time of the Commonwealth, that the government ordered its removal. Images of the four evangelistic symbols were especially circumscribed, so it is beyond belief that four such images could survive unscathed in their original location. Bearing in mind that Suffolk was one of the most puritan areas of England, their survival here would not merely be a moving reminder of lost Catholic England, it would severely test the bounds of credibility. Here, each of them is set above or below a shield of a branch of the Drury family, which appear to be medieval. Now, one possible clue to their origin may be that neighbouring Nowton has 84 roundels of late medieval Flemish glass plundered by the eccentric Colonel Rushbrooke from Belgian monasteries in the early 19th century. So it is entirely possible that he acquired these by means fair or foul as well. But before we consider this possibility, let us consider the other two roundels, which are even more remarkable. Set high in the window is a roundel image of St Catherine, clearly restored - which is to say, of course, that parts of it are medieval. The roundel below is fascinating. It shows St Edmund's head and the wolf, a familiar Suffolk scene. Charmingly, the wolf howls heer, heer, heer! 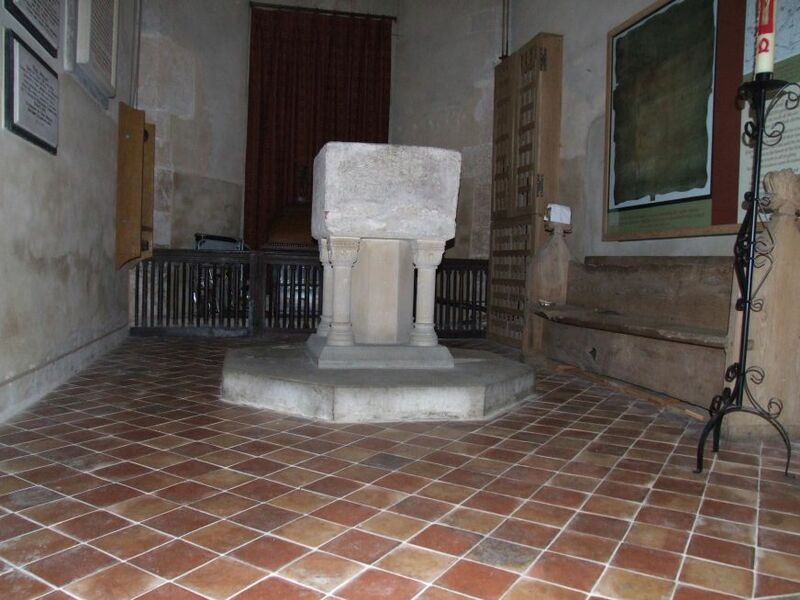 The legend of St Edmund survives at Troston and Thornham Parva in wall paintings, and on the font at Badingham, as well as several other places in various forms. But the survival of such a perfect image in undamaged form would seem extraordinary, even beyond belief. In fact, they are all fake, apart from the older fragments of the St Catherine roundel. The St Edmund scene is the work of Dennis King of Norwich, and is a copy of a badly damaged 15th century roundel now in the Bury Abbey visitors centre. The St Catherine panel is almost certainly a King Workshop restoration, so possibly the Evangelists are from the same source. The other glass appears to be reset around the Edmund panel. There's a chance that the Evangelist roundels may be the work of a Victorian amateur. They put me in mind of the fake medieval roundels at Stowlangtoft, which were probably produced by a daughter of Samuel Rickards, the Vicar. There are also two rectanguar panes, which I take to be genuine Flemish. They recall the work nearby at Great Saxham. The Flemish glass there was collected by William Mills in the early 19th century. Or perhaps they came from Colonel Rushbrooke's collection. Of the glass here, one is a rood group, dated 1670 (not 1570, as in some sources) at Elsberg, the other St Peter and St Paul, flanking fragments of medieval glass formed into a cross. What may be most memorable to the casual visitor is the fine collection of late 19th century and early 20th century glass elsewhere in the church. A brief tour of it, then, to finish with. In the chancel north window is a double panelled window depicting St George and the obscure St Géry, by the Nicholson Workshop of London. The Saints appear to have been chosen to commemorate the names of two members of the Cullum family. The best details are the scenes at the base, particularly St George dispatching a dragon. Directly opposite is a window depicting the Annunciation. A rather feminine St Gabriel kneels before Mary, while all around angels intone the Ave Maria and the Magnificat. It may well be by Powell & Son, and probably dates from just after the First World War. The best glass is in the nave. That on the south side is by Henry Holiday, and was produced for Powell & Sons. One set depicts the figures of Faith, Hope and Charity. Faith gazes down on Charity's child, while Hope looks up expectantly. Best of all is the window beside it, also by Henry Holiday. It depicts the Archangels Gabriel, Michael and Raphael. Gabriel in particular is gorgeous as he indicates with his hand the path of salvation. Raphael is more introspective, and Michael triumphantly kills off the dragon at his feet. Above the north door is a crucifixion, and the scene is flanked by two famous former Rectors of the Church. On the left is Sir John Cullum, the late 18th century antiquarian. Facing across to him from nearly two centuries later is John Hall, the persecuted Laudian Bishop of Norwich. The great space under the tower has been reinvented as a baptistery, with a statue of the infant Christ looking alarmingly like the Mannequin Pis gazing down from above. 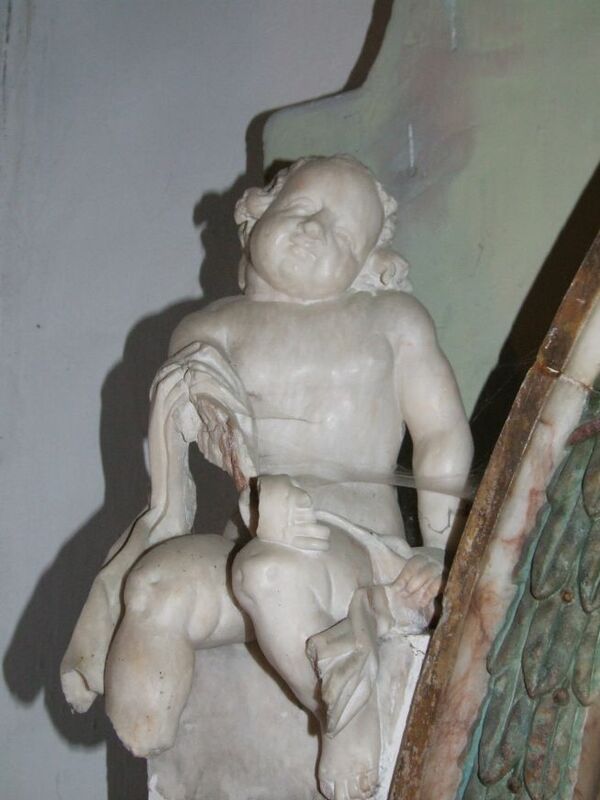 A figure of St John the Baptist forms a finial on the font cover. No less than five hatchments hang in this space. One intriguing detail to finish with. The sanctus bell stirrup has survived, one of only two such survivals in the county (the other is at Somersham). Even more excitingly, it has a bell still in it. It sits above the southern end of the roodscreen, with the lowside window below. Mortlock paints a romantic picture of the acolyte sitting beneath it, ringing it at the consecration of the Mass, and opening the lowside window to let it ring out to the people in the fields (and allowing an updraft to the rood, which would set the candles flaring in a dramatic manner). If it isn't the original bell, I'm not sure I really want to know.